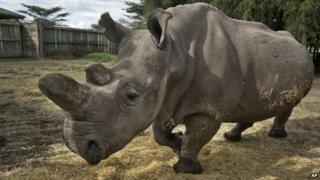 A northern white rhinoceros has died at the San Diego Zoo in California, leaving only five in the entire world. Angalifu, a male thought to be 44 years old, is said to have died of old age. One of the critically endangered species remains at the California facility, while another resides in a Czech Republic zoo and three remain in a Kenyan preserve. The rhinos have been hunted by poachers to near extinction for their valuable horns, used in dagger handles. "Angalifu's death is a tremendous loss to all of us," San Diego Zoo safari park curator Randy Rieches wrote in a statement. Earlier attempts to mate Angalifu with the zoo's other northern white rhino, Nola, were unsuccessful. Meanwhile, preservationists at the Kenyan preserve have acknowledged their one male and two female rhinos will not reproduce naturally. In vitro fertilisation efforts will now reportedly be undertaken to keep the species from extinction.